British Columbia rider Ali Ramsay and her mare Hermelien VD Hooghoeve won the first FEI event of the International Bromont, presented by the Ministère de l’Éducation et de l’Enseignement Supérieur du Québec. Course designer Leopoldo Palacios’s (VEN) course comprised 13 obstacles for 16 efforts, including three double combinations. With 85 seconds of time allowed for the first round, the course proved to be difficult for the thirty-three registered duos. The last combination of two verticals proved especially daunting. Only seven pairs qualified for the second round: young Canadian Ali Ramsay, with Hermelien VD Hooghoeve, Julia Madigan with Farfelu du Printemps and Jennifer Serek on her two mounts, DHI Zulu and Wicked respectively, Colombian riders Carlos Ramirez on Happy Wandor Vant Roosakker and Juan Manuel Gallego on Coulash Van de Broy Z, as well as American rider Nicholas Dello Joio with Contiki. Carlos Ramirez establishes the time to beat at 46.18 seconds, with a perfect second round on his stallion Happy Wandor Vant Roosakker. Young rider Ali Ramsay, coached by Olympic rider Jill Henselwood, takes the lead with an impeccable course in under 43 seconds. Last on the course, Nicholas Dello Joio (USA) and his gelding Contiki come out strong, but the chronometer stops a few tenths of a second behind Ali Ramsay’s. Competition continues tomorrow with the Modified Grand Prix event and the especially popular Hunt Derby. 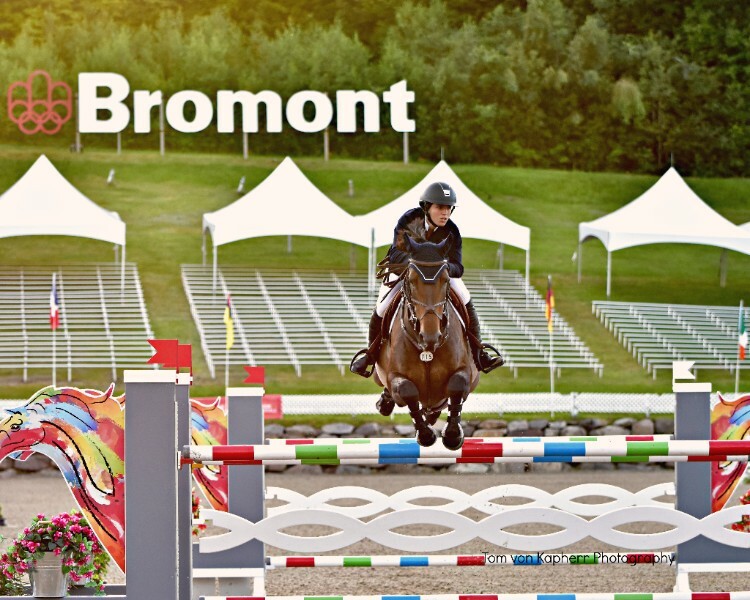 The International Bromont presents its 42nd edition in the picturesque setting of the Bromont Olympic Equestrian Park, in the heart of the beautiful region of the Eastern Townships. For more information on the programme, visit our Web site at www.internationalbromont.org.